The Victory Ride to Cure Cancer presented by Braswell Family Farms can only happen with the support of dedicated volunteers. Bring your friends and family, too! Victory takes teamwork, and we need everyone on our team! Cost: There is no registration fee or fundraising minimum to volunteer. However, we do encourage you to create a fundraising page and goal. Every dollar you raise makes a difference. Click here to learn more about fundraising. 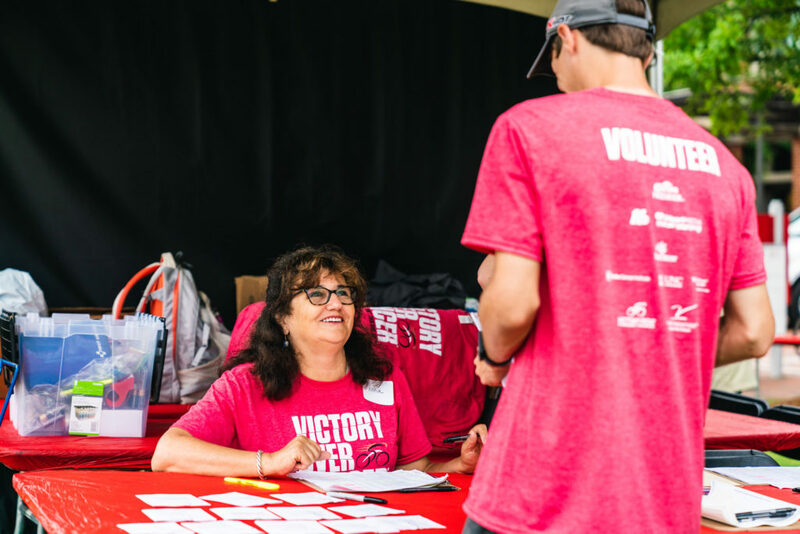 Age Requirement: Anyone 13 or older is welcome to volunteer for the Victory Ride. If you are between the ages of 13-17, you must be accompanied by an adult who is also a registered volunteer. Time Commitment: As a volunteer, you can donate a few hours of your time or an entire day! We offer a number of volunteer shifts with varying time-commitments from 6:00 a.m. - 6:00 p.m.
You work well together; now volunteer together! Consider taking the call for volunteers company-wide at your workplace. It’s fun to spend time with your colleagues outside of the day-to-day. It shows you are a good citizen in your community. It promotes an active lifestyle with your employees. Check-in riders, distribute their fundraising rewards and assist with providing general information. Attention to detail and a friendly smile are very important. Heavy lifters needed to assist Victory Ride staff with event site set-up on the NC State’s Centennial Campus. Tasks include setting up tables, chairs and barricades, hanging signage, dressing tables, and other aspects of site prep before Ride day. Monitor bike staging area, making sure only riders are coming in and out. Helping riders get bike racked as needed. Collect rider gear bags, make sure they are numbered correctly and put in correct location, help riders retrieve gear after the ride. Assist with directing riders to the parking areas. Help corral riders, make sure riders are in correct corral based on distance. Help direct riders back staging, keep them moving. Cheer on riders as they finish. Cut up fruit, put out drinks/snacks for the riders, keep snacks/refreshments stocked. Greet riders and spectators when arriving and assist with directing them to the Festival Site. Assist with trash/recycle clean up during the event. At the conclusion of the event, assist with the breakdown of all Victory Ride elements on the Festival site. There may be some heavy lifting involved (35-50 lbs). Assist with onsite clean up. Be the leader at one of the eight rest stops along the route, providing water, sports drinks and snacks to riders. Assist with directing other volunteers at the rest stop. Rest stop teams set up and run one of the eight rest stops along the route, providing water, sports drinks and snacks to riders. Great opportunity for groups. Must be able to lift 30 lbs. Route safety volunteers will be located along the route where riders need a reminder to slow down before a turn, to unclip from pedals before crossing a busy road or to provide traffic management at a busy rest stop. A two-person team follows behind the last rider in a vehicle for a designated course (10, 30, 60 or 100 miles) and picks up route signage from the course. Must be able to drive an event minivan and lift up to 25 lbs. Valid driver’s license required. SAG vehicle volunteers are two-person teams driving passenger vans who pick up riders experiencing fatigue or mechanical problems between rest stops. Both members in each SAG vehicle must be able to drive and get in and out of the van quickly. Must also be able to lift 20-30 lbs. Valid driver’s license required. We can't wait to share this experience with you! If you have questions, please email [email protected].